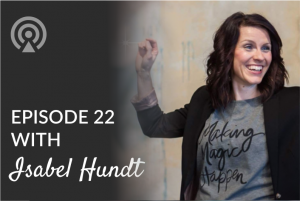 Isabel Hundt is an inspirational speaker, sociologist and emotions clearing practitioner who works with highly sensitive visionaries and world-changers who tend to be more introverted but have a big vision that they struggle to bring out (because they’d rather hide so as not to overstimulate their nervous system). She also studies and coaches on epi-genetics and trans-generational transmitted trauma. In this episode, Isabel and I discussed how she initially tried to logically craft her way to success (which, not surprisingly, didn’t work! ); the way that your physical life provides evidence of your truest, deepest thoughts; and the below-the-surface reason you have trouble making peace with the moments when you’re stuck in a place of “doing all the things you’re supposed to do,” but it feels like nothing’s changing. This episode is brought to you by my latest FREE DOWNLOAD: “Entrepreneurs – Write Your Book Already!” If you’ve been thinking about writing a book but continue to put it off because you aren’t sure where (or how) to start, this guide is for you!